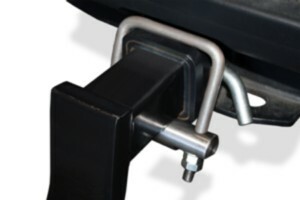 Quiet Hitch™ stops that noisy, irritating rattle that vibrates through your trailer frame whenever you drive over a pothole, speed bump or railroad tracks. It eliminates free play between the ball mount and receiver for a solid, seamless connection that lets your rig track straight through crosswinds, curves and sudden maneuvers. Quiet Hitch helps reduce wear and tear on the hitch, coupler and your trailer tires by limiting free play and related sway. Quiet Hitch bolts on in seconds and is available in three sizes for 1¼-inch, 2-inch and 2½-inch hitch receivers.